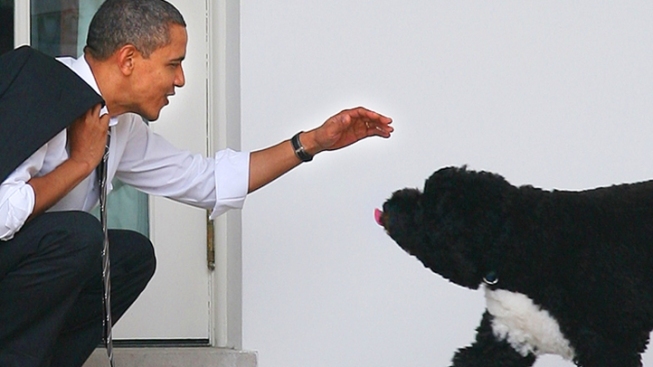 President Barack Obama greets his dog Bo outside the Oval Office of the White House. This article is sponsored by JetBlue Election Protection. Vote online and if your presidential candidate doesn’t win, don’t worry. Here’s your chance to get out of the country with a free flight from JetBlue. Register now at www.jetblue.com/electionprotection. Animals are no strangers to the White House. With the exception of heartless men like James Polk, Franklin Pierce and Chester Arthur, every President has brought a favorite family pet to 1600 Pennsylvania Avenue. Or more than one pet. JFK and his brood were so fond of animals they amassed a veritable ark load of critters, from kittens and canaries to ponies and pups. Likewise, Calvin Coolidge couldn't say no to animals presented as gifts from foreign dignitaries. During his Presidency, the White House practically transformed into a zoo teeming with lion pups, dogs and even a pygmy hippo. But of all the animals that have roamed those hallowed halls, several standout for their personalities, utter cuteness and--in some cases--angelic singing voices. And so without further ado, we bring you the Top 10 Presidential Pets of our nation's illustrious history (because, by jove, someone had to!). LBJ might have always been photographed with his two beagles Him and Her, but it was a small mutt named Yuki that stole the President's heart. Originally picked up at a Texas gas station by his daughter Luci Nugent, Yuki--which is Japanese for snow--quickly found his way off the streets and into the White House, where he'd howell the night away and even sing duets with the President himself. When First Lady Helen Herron Taft realized that the family cow wasn't producing enough milk for her growing kids (not to mention her husband's ever growing waistline), she instructed Wisconsin senator Isaac Stephenson to purchase a Holstein cow. Named Pauline Wayne, the black and white bovine grazed on the White House lawn. But the family considered Pauline as much a pet as they did livestock. Until, that is, President Taft decided to deep fry her and eat her for lunch. We kid, we kid! Pauline lived out her post Presidential pet years in her native Wisconsin. Perhaps no Presidential pet wielded greater influence than Herbert Hoover's King Tut. The Belgian Shepherd Dog accompanied the candidate during his campaign, and many people believe that an image of Hoover posing with his four-legged friend helped humanize the otherwise icy man to voters. Once in office, Tut typically patrolled the White House grounds, no doubt mulling over various international matters and other Presidential affairs. When General Marquis de Lafayette of France brought an alligator to the White House as a gift, President Adams was unsure of where to put the reptile. So he did what any sensible statesman would do: He chucked it in the East Room bathtub and used it to scare guests! (We're told that Adams kept all gifts from his other French friend, the Marquis de Sade, locked in the basement). When Bill Clinton took office in 1993, he moved into the White House with his wife, daughter and their cat, Socks, so aptly named thanks to his white paws. The former stray dug his new digs instantaneously. What he didn't dig was Buddy, a chocolate lab who joined the family shortly into Clinton's second term in office. The President would later say he did a better job with Israel-Palestine relations than he did with Buddy and Socks, and the two Presidential pets lived in separate rooms. But despite their contentious relationship, they were immortalized when Hillary penned the children's book Dear Socks, Dear Buddy: Kids' Letters to the First Pets in 1998. Nothing screams 'Merica louder than the piercing caw-caw of a Bald Eagle. Just ask Stephen Colbert. Or former President James Buchanan, who kept two while in office. To stave off loneliness, the life-long bachelor surrounded himself with his jungle friends, from his massive Newfoundland dog to a herd of elephants donated by the King of Siam. But it was his two winged wonders that really got his Presidential juices flowing. A gift of conservative pundit William F. Buckley Jr., Rex was actually Nancy's dog. And he was thoroughly spoiled by the First Lady. Rex's dog house was built by the Washington Children's Museum and the structure was christened by Zsa Zsa Gabor. Another fun fact? He was named after the White House Chief Usher (who we're sure was flattered). Every little girl dreams of a pony, and if you're the President's daughter, that dream comes true. A gift from Vice President Lyndon B. Johnson, Macaroni the Pony was one of Caroline's most prized pets and it openly roamed the White House grounds. The League of Nations wasn't President Woodrow Wilson's only innovation. The 28th President of the United States also kept the White House lawn looking good with his sheep. Old Ike, a tobacco-chewing ram, quickly became his favorite member of the flock. Liberty was a popular pet, always posing for photo opps whether she was doggy paddling in the Camp David pool or giving birth to puppies. Ford was very fond of the dog, and one night when he took her out "to do her business" he forgot to notify the secret service and found himself locked out of the White House. NO PURCHASE NECESSARY. Ends 11/5/12. For Official Rules, visit www.jetblue.com/electionprotection.